Bio: Kayla is a PhD Candidate in Linguists at UC Berkeley. Bio: Hiestum! (Greetings) Vanessa is enrolled member of the Nor Rel Muk Wintu Nation and Chicana. She is a Ph.D. student in Native American Studies at University of California, Davis and received her BA in Anthropology and Ethnic Studies with an emphasis on Native American Studies at CSUS. Her focus is on Native American Graves Protection and Repatriation Act (NAGPRA), cultural patrimony, Native Americans in higher education and Native American language revitalization programs concerning Northwestern tribes. Bio: Niwho:n je:nis whima:lyo' (Good day my friend/relative in Hupa) skue-yen' ue ke-choyhl nak-new Marlette Grant- Jackson. Hoopa mey'-wue-me-chok (good afternoon, my name is Marlette Grant-Jackson. I am from Hoopa. in Yurok), ITEPP CRC Coordinator, and Student Service Academic Advisor. I work at HSU and have worked for the ITEPP Program for 12 years. REVIEW -- Yamane, Linda. Weaving a California Tradition: A Native American Basketmaker. Lerner Publications, 1997. Bio: Melissa received her Ph.D. in Native American Studies from the University of California, Davis. Her research focuses on contemporary forms of cultural and linguistic revitalization and empowerment. Her career has been dedicated to working with youth in the Sacramento region. REVIEW -- Shanks, Ralph C., and Lisa Woo Shanks. Indian baskets of central California: art, culture, and history: Native American basketry from San Francisco Bay and Monterey Bay north to Mendocino and east to the Sierra Nevada. Vol. 1. Costaño Books, 2006. Bio: In 2014 Stephanie received her M.A. in Native American Studies at the University of California - Davis. She received her BA in Women’s Studies with a Minor in Native American Studies from Portland State University. Her Master’s thesis research focuses on Native American women and the prison-industrial complex in California. REVIEW -- Bibby, Brian. Precious cargo: California Indian cradle baskets and childbirth traditions. Heyday, 2004. 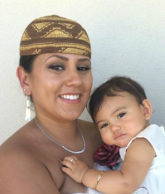 Bio: Brittani Orona is an enrolled member of the Hoopa Valley Tribe and is currently completing her Master of Arts in Public History at California State University, Sacramento (CSUS). She graduated with a Bachelor of Arts in History from Humboldt State University in 2010. She has worked at the California State Indian Museum, the California State Office of Historic Preservation, California State Archives, and the Maidu Museum and Historic Site. She will join the CSUS Center for California Studies: Capital Fellows Program- Executive Fellowship in October 2014. Brittani is interested in repatriation, federal Indian law, cultural resources management, and environmental history as they relate to California Indian tribes.